The convention also included a valedictory address by retiring U.S. Senator Barry Goldwater of Arizona. Goldwater was widely credited as the political founder of the New Right in the United States, of which Reagan was the political heir, and indeed Reagan had gained notice for his "A Time for Choosing" speech supporting Goldwater in October 1964. 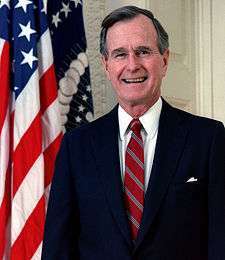 Vice President George Bush gave a powerful address, some believing it debuted him as the de facto nominee of the GOP in 1988. 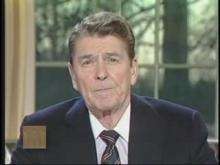 President Reagan spoke after, and addressed the nation and the party on the future and highlighted the "Morning in America". Country singer Lee Greenwood was also featured, and sang "God Bless the USA," which had been released earlier that year. ↑ "1984 Jeane Kirkpatrick". CNN. ↑ Gromer Jeffers, Jr.; Joe Simnacher (September 24, 2012). "Fred Meyer, who built Dallas and Texas GOP into dominant force, dies at age 84". The Dallas Morning News. Retrieved March 18, 2015. ↑ "Jan Jarvis, "Humble man gained national attention for burying flag that had been set on fire at protest"". Fort Worth Star-Telegram, September 16, 2009. Retrieved September 22, 2009.